This morning, as usual, I ease myself out of bed and creak about for half an hour before I wake up properly. Surely, I should feel fresh and fit to go after a night’s sleep… maybe it’s my age… maybe that last glass of wine or piece of chocolate? I do try to eat better, cross my heart! I could go for a walk or run, get an exercise DVD or knock the dust off the one I bought last year. It’s boring on your own though. Maybe I could join a class but then everyone else will be fitter than me. This afternoon I’ve arranged to meet Lorraine Platt from North Manchester Fitness. She’s a fitness coach. 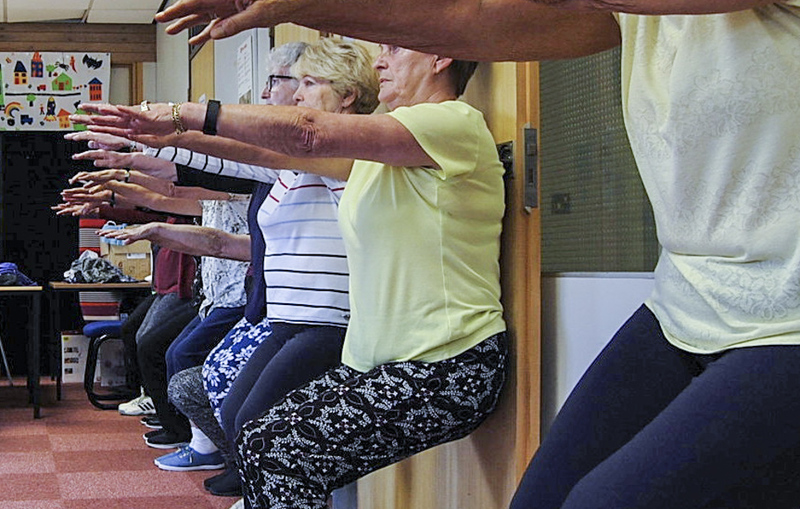 Today she’s running a gentle exercise class for the over 50s. Perfect! I’m over 50, just about! I’m late. “Do you know where the exercise class is?” I ask the ladies at the door. “Follow us. Are you new? You’ll love it, we do”. Down the corridor, turn right, passed the toilets and I hear music. Somewhere Over The Rainbow by Eva Cassidy. I love it already. They put me at the front so I can see Lorraine and follow her lead. It’s all to music. We warm up, gently stretch, bend this way, step that, do a dance routine, some strengthening work and I’m out of breath a bit so have a rest. Nobody minds, the ladies in the group are wonderful and carry on. I take some photos and then it’s time to meditate and relax. Before I know it I’m chatting to Lorraine. We talk about North Manchester Fitness and what activities they offer. Running in Boggart Hole Clough is one of them. They understand not everyone likes running – me included – so she takes a walking group. We’re on the same wavelength here so in my head I promote her to genius. Lorraine continues: “We also do fitness/aerobic classes, gym sessions, pilates, sprinting and marathon training.” Including Lorraine, there are four England Athletics qualified coaches. Getting that qualification takes effort and means they’re not just committed, they’re competent as well. Lorraine hands me one of their information sheets. There’s something every day of the week, morning, afternoon or evening, at locations across Harpurhey, Blackley and Prestwich so they’re all local. “Why do you get involved with North Manchester Fitness?” I ask. 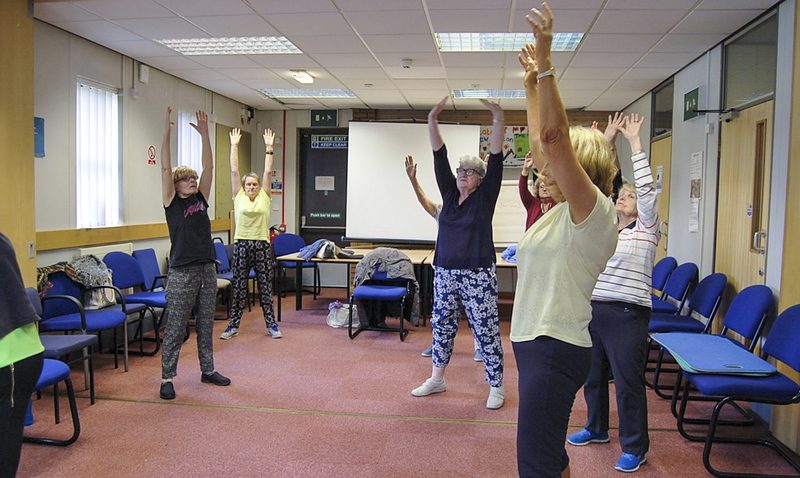 “I love being a fitness coach and North Manchester Fitness is a great group to join if you want to improve your fitness, make new friends, feel healthy and more confident. A brisk walk is a great way to start the day. We walk and chat in Boggart Hole Clough from 9 till 10 every Saturday morning, whatever the weather. It blows the cobwebs away!”. It doesn’t stop there. They’re a very sociable group with celebrations after all the big races, an annual fitness weekend in Blackpool, even a Christmas party. I’m impressed with Lorraine and the fitness classes. It was only one session but I feel energised somehow. I’m going to leave that last glass of wine in the bottle from now on, put the chocolate away and get some exercise. Might get up fresh and fit to go after all!